There are over 240 hatching egg producers operating in 8 provinces across Canada. In 2017, hatching egg farmers produced 757.3 million broiler hatching eggs worth more than $317.7 million. The hatching egg industry supports 4,200 direct and indirect jobs in Canada. Not just farmers, this includes researchers, marketers, food processors, transporters and more. The hatching egg industry helped supply more than 2,800 chicken farmers across Canada in 2017. As a general rule, each hatching egg farmer produces enough broiler hatching eggs to supply chicks for 8 chicken producers. The average hatching egg farmer in Canada raises flocks of 10,000 to 15,000 breeder birds. Each breeder hen will typically lay 150 to 160 fertilized eggs over the course of a laying cycle that normally runs 34 to 36 weeks in duration. 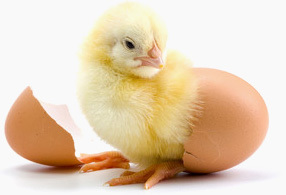 What is a broiler hatching egg? While people are familiar with the eggs they buy in the grocery store, broiler hatching eggs are fertilized eggs that eventually hatch to produce a chicken. Broiler hatching egg producers are responsible for the production of these broiler eggs and their distribution to hatcheries. Once they reach the hatcheries, these broiler eggs are placed into special incubators for about 21 days, when they then hatch into broiler chicks. These broiler chicks are sold to chicken farmers who raise them into fully-grown chickens. This cycle, from fertilized egg to fully-grown chicken, takes approximately eight to nine weeks. CHEP is a national organization that represents 225 producers from British Columbia, Alberta, Saskatchewan, Manitoba, Ontario and Quebec. Our mission as an organization is to continue to grow a sustainable and profitable broiler hatching egg industry in Canada to ensure a strong, efficient and competitive industry that creates a dependable supply of quality broiler hatching eggs to Canadian chicken producers. CHEP accomplishes this mission by ensuring that broiler hatching egg farms are producing enough eggs to meet the demands of the Canadian chicken industry. Like the chicken, turkey, egg and dairy sectors, CHEP operates under the supply management system. The supply management system uses quota, import and price controls to help maintain a stable supply of eggs for Canadian chicken producers. This allows these producers to work in a more stable environment. Prices for their products do not fluctuate due to outside market pressures beyond their control. This system helps producers deliver a steady supply of products to Canadian consumers and the food service industry. Click here for to learn more about supply management. CHEP provides direction on allocation, production and distribution of broiler hatching eggs, policy matters and many other issues through their board of directors. Consisting of nine members, the board of directors is made up of one elected farmer representative from each of the six-member provinces (British Columbia, Alberta, Saskatchewan, Manitoba, Ontario and Quebec), two members appointed by the Canadian Hatchery Federation and one non-voting chair. CHEP is funded through farmer levies, which are payments based on the amount of hatching eggs that each farmer produces. Three times a year, CHEP convenes industry meetings, bringing together producers, representatives and stakeholders of the poultry industry from across Canada to review market conditions and establish provincial broiler hatching egg allocations. This allows producers to meet the anticipated market requirements of the Canadian chicken marketplace. These meetings are also used to discuss various regulatory issues related to supply management, inter-provincial trade of broiler hatching eggs and chicks, international trade, food safety and animal welfare. Click here to see annual reports on the Canadian broiler hatching egg industry [Link to publications page]. CHEP is committed to ensuring that the eggs produced are of exceptional quality. To achieve this, CHEP has implemented the Canadian Hatching Egg Quality Program (CHEQTM). This program is consistent with the food safety approach of the Canadian Food Inspection Agency (CFIA) and is based on international Hazard Analysis Critical Control Point (HACCP). In simple terms, CHEQTM provides producers with a comprehensive set of Good Production Practices that each farmer follows. The Canadian poultry industry has instituted a “gate to plate” strategy for food safety, which ensures that every stage of the supply chain, from broiler hatching eggs producers to hatcheries to feed mills and chicken farms, all participate in complementary food safety initiatives. Animal health and welfare are CHEP’s top priorities. Farmers closely monitor their flocks to assess behaviour, productivity and health, and maintain the ideal environment for their birds. To demonstrate our commitment to our animals, CHEP has recently developed an auditable on-farm Animal Care Program designed to promote a high level of animal welfare on all hatching egg farms in Canada. This program ensures that all producers involved are adhering to the Poultry Code of Practice and that all animals are raised humanely. CHEP’s Animal Care Program makes sure that broiler breeders have a safe and comfortable environment. It also verifies that farmers meet the requirements and are following guidelines for space, water, feed, lighting, air circulation, handling, and more. Research is an important part of our efforts to continuously improve. CHEP administers a producer-funded research grant program that supports researchers across Canada in their efforts to improve the health and performance of breeder hens, taking into account environmental and animal welfare concerns. CHEP also funds research on health and welfare, food safety, the environment and alternatives to antibiotics and is a founding member of the Canadian Poultry Research Council. For more on research results, click here. Supply management is a regulatory system within Canada to prevent the market from being oversupplied with certain agricultural products, which would result in drastic reduction in prices for farmers without a reduction in costs incurred to produce. It allows supply-managed farmers to have a predictable income which allows them to plan, invest and improve their operations and support rural economies without government funding or subsidies. New entrant programs support new growth within the industry. Under supply management, CHEP farmers produce high quality broiler hatching eggs to meet the needs of the chicken industry that contributes to a steady supply of safe, high quality and nutritious chicken to Canadian consumers and the food service industry. It allows the entire poultry supply chain to work together. Hatching egg producers know how many eggs they need to produce to meet the demand of chicken producers. Hatcheries can maintain the proper number of incubators for broiler hatching eggs, and chicken producers can count on a steady supply of chicks when they need them and at a predictable price. The quota system is the cornerstone of supply management. Every farmer in the system buys quota, which allows each of them to produce a certain amount of product and nothing more. This helps prevent overproduction and concentration within the agriculture industry, both of which are a burden on the environment and hurt smaller producers.